Semacon S-1600V Series — C&A Associates, Inc. The Semacon S-1600V Series Premium Bank Grade Currency Value Counters are designed with Semacon’s SmartFeed™ technology for very high volume applications and are used by banks, credit unions, casinos, large retailers and other industries. They feature heavy duty construction, operational flexibility and ease of use. The series offers optional ultraviolet (UV) and magnetic (MG) counterfeit detection. 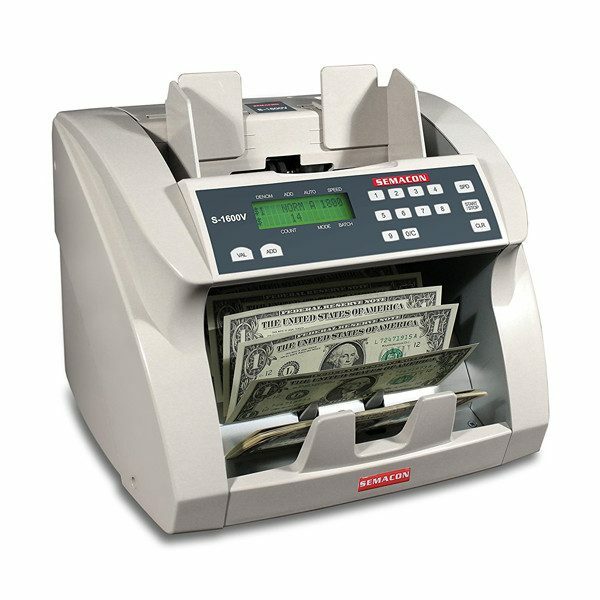 The S-1600V Series includes a value counting mode feature which enables the machine to count in dollars and to total a teller station or cash drawer. These counters were developed specifically for banks and other businesses with high cash volumes and are capable of continuous operation in the harshest environments. Note: This counter is not a currency discriminator and cannot determine currency denominations.